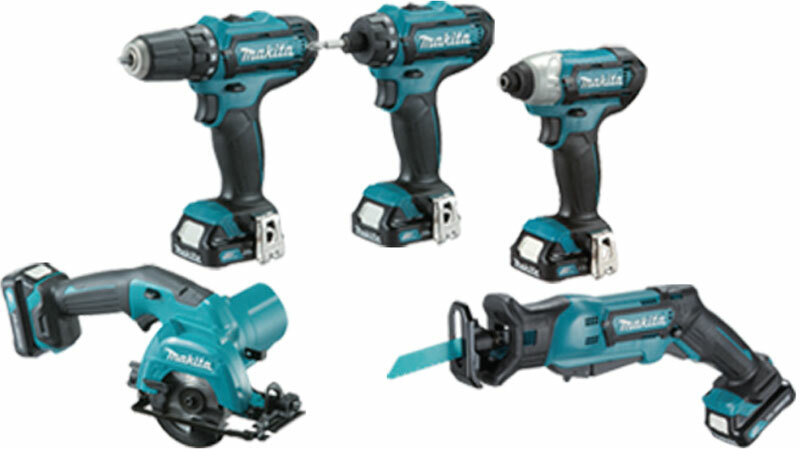 Makita’s new Compact eXtreme Technology - with powerful new 12Vmax slide batteries in 1.5Ah, 2.0Ah and 4.0Ah. Multi-contact slide batteries with high capacity cells. Makita’s 'CXT' range of 12Vmax tools featuring a new 12Vmax Lithium-Ion slide battery, similar to the 18V Li-Ion battery used in the LXT tool range, has multi-contact terminals to ensure stable contact even under extreme work vibration conditions. The slide battery fits easily into the tools and new chargers and has built-in protection to prevent overload or over discharging. The new slide batteries have protection overload circuitry, will operate down to -20°C and have a 4-stage LED fuel gauge indicator. Both the DC10WD and DC10SA chargers have a fan cooling system, and rapid charging time is just 30 minutes for the 2.0Ah battery. The new 12Vmax slide battery is fitted to the latest 'CXT' range of tools which includes a Driver, Hammer Drill Driver, Impact Driver, Reciprocating Saw and 85mm Circular Saw. The latest 12Vmax slide battery range will continue the expansion of the Makita range.